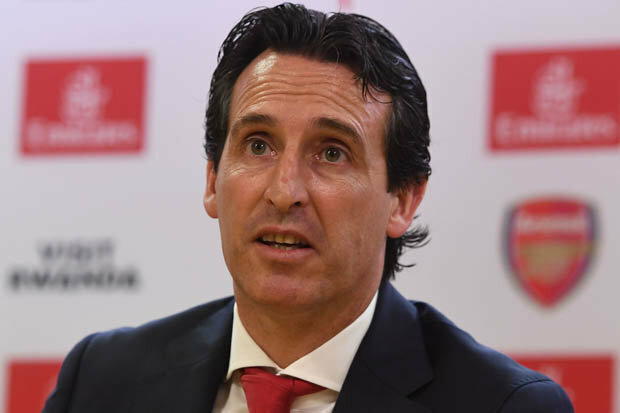 Unai Emery has conducted his first pre-match press conference since becoming Arsenal manager and he’s offered an update on his transfer plans for the rest of the summer. Emery has wasted no time revamping the squad he inherited from Arsene Wenger having already brought in five major signings this summer and the boss has targetted areas that needed addressing. A new goalkeeper has arrived after we signed Bernd Leno, cover for Hector Bellerin at right-back has been added with the signing of Stephan Lichtsteiner from Juventus and an experienced centre-back to replace Per Mertesacker has come in with the £16m arrival of Sokratis. We’ve finally got ourselves a proper defensive midfielder after splashing out on Lucas Torreira while Emery has also brought-in highly-rated midfielder Matteo Guendouzi from Lorient. However, the media continue to link us with a number of players and Steven N’Zonzi has been strongly linked with a move to the Emirates in recent weeks with widespread reports suggesting we’re in talks with Sevilla for the French international. Emery has said that although he’s happy with his squad he hinted there could be one or two more arrivals before the end of the window if the right player becomes available, however, he insists no offer has been made for N’Zonzi. Normally, in my career the big clubs don’t close the [door] or the moment to sign a new player. Today, we are OK. Maybe we can bring in one if there’s a very good possibility for them to help us, but the club has done a great job of signing new players and I am happy. We signed the players who we needed and only if one player is a big opportunity for us will we sign them. Normally, we are thinking about the young players, the possibility of them staying with us or going to play on loan at another team. We are also thinking about the players who were with us last year and whether we need them to stay with us. At the moment, I think the squad is complete. We will only sign another player if there is an opportunity to bring in that one player, or two players. We will only sign a player in the next month if he’s a big opportunity. I think we’ve done some excellent business so far this summer but I’d still like to see us add a pacey winger to the squad as I feel we lacked pace in wide areas last season. Perhaps that’s the type of player Emery is hinting at as we’ve been linked with several wingers in the papers so hopefully our new boss has another surprise up his sleeve before the end of the summer.